Yet over the last 20 years we have deprecated “unity” and championed “diversity.” Americans are being urged by popular culture, universities, schools and government to emphasize their innate differences rather than their common similarities. But unchecked tribalism historically leads to nihilism. Needless to say, read the whole thing. MATT TAIBBI: As the Mueller Probe Ends, New Russiagate Myths Begin: Donald Trump couldn’t have asked for a juicier 2020 campaign issue. This meant we should read between the lines of what Mueller ended up “saying,” so we can divine (I use that religious word on purpose) his true meaning. By not delivering the desired goods, Mueller is now being described as “The God that failed Democrats,” by Edward Luce of the Financial Times, who makes the shockingly belated observation that the Democrats putting all their hopes in the “magic bullet” of the Mueller investigation “postponed the harder, less glamorous work the party needs to be doing.” . . .
It’s almost like you can’t believe anything they say. MICHAEL WALSH: Prizzi’s Honor, Seed of Chucky. Trump’s best play, then, is to string out the shutdown as long as possible, keeping the pressure on the Democrats either to acknowledge the problem on the border, and the moral necessity of protecting the country from what amounts to a slow-motion invasion — a reconquista — from the Latin south, or to simply drop all pretense and come out for the abolition of the country as founded, on the grounds of, you know, racism. As Maerose Prizzi and her consigliere are discovering, what can’t go on forever, won’t. TRUMP ADMINISTRATION TO RESCIND THE OBAMA-ERA GUIDELINES ON RACE IN COLLEGE ADMISSIONS? : The Wall Street Journal is reporting that it will do so soon. If so, it is good news. Those guidelines encouraged, rather than discouraged, race discrimination. Every year, HUD sets income limits that determine who can qualify for housing assistance, including Section 8 vouchers, public housing and other assistance programs. The calculation is also used to set eligibility for affordable housing built by developers who receive tax credits. In the San Francisco metro area, which includes Marin, San Francisco and San Mateo counties, an income of $44,000 or less for a family of four is considered extremely low, while the upper limit for having a very low income is $73,300. These numbers are certainly eye-popping — and they have been rising swiftly. In 2014, the extremely low income limit was $33,200, the very low was $55,350 and the low was $88,600. Home prices have been rising at an impressive clip, too. The median home value in the San Francisco metro area was $947,500 at the end of April, while the median rent was $3,300 a month, according to Zillow, a real estate marketplace. Only 15% of San Francisco county residents could afford a median-priced home in the first quarter of 2018, according to Paragon Real Estate Group. That compares to 57% in the United States overall. Anything which can’t go on forever will stop. DEMOGRAPHICS IS DESTINY: Darn. I may outlive Social Security. That’s just 16 years from now. I’ll be 79, and hope I’ll have a few years left, though I doubt I’ll be in shape to go job hunting. As maddening as that prospect is for someone who has been paying into both systems for a half-century, I feel for the generations behind me. I’ve still got a shot at getting some of my money back. There seems no chance they’ll ever collect anything. Given the vast number of Baby Boomers heading into retirement, you’d think these doomsday reports would trigger a panic response from Washington. SUSTAINABILITY: In 16 years, Social Security will have to cut benefits by 21% if lawmakers do nothing to cure the program’s long-term funding shortfall. So if you were expecting to get $2,000 a month, your payout would shrink to $1,580. IN THE EMAIL FROM KAL SPRIGGS: Valor’s Duty. She will need to muster every ounce of courage, every bit of intelligence, in order to save her friends. Even then, her own survival might be too much to ask. But Jiden doesn’t know how to back down, and she’ll do her duty no matter the cost. AN UTTERLY PREDICTABLE CATASTROPHE: A debt crisis is on the horizon. President Trump’s recently released budget is a wake-up call. It projects that this year, a year of relatively strong economic growth, low unemployment and continued historically low interest rates, the deficit will reach $870 billion, 30 percent greater than last year. For years, economists have warned of major increases in future public debt burdens. That future is on our doorstep. From this point forward, even if economic growth continues uninterrupted, current tax and spending patterns imply that annual deficits will steadily increase, approaching the $1 trillion mark in two years and steadily rising thereafter as far as the eye can see. SUSTAINABILITY: Medicaid Enrollees Set to Climb 40,000,000 Under Obamacare. Under current law—including the Patient Protection and Affordable Care Act (AKA Obamacare)—there will be 112,000,000 people who enroll in Medicaid at some time during fiscal 2027, according to the latest baseline estimate published by the Congressional Budget Office. The US population is expected to increase by less than 15% from 2013 to 2027, while the CBO now reports that Medicaid enrollment will grow by nearly two-thirds. So just a reminder that anything which can’t go on forever will stop, and promises which can’t be kept, won’t be kept. INVESTOR’S BUSINESS DAILY: Democrats Will Soon Regret That Republicans Failed To Repeal ObamaCare. ObamaCare was never sustainable. Something that can’t go on forever, won’t. SUSTAINABILITY: Budget Deficit Revised Upward by $100 Billion. The good news is that if the GOP can pass a health care reform bill, the deficit will be a little less, which is better than nothing. The bad news is that we still have a Congress — and since the president proposed the budget, he’s no better — that refuses to make the hard choices to bring the budget under control. Yes, it’s hard to reform entitlements, which are only going to add substantially to the budget deficit and national debt over the next decade as Social Security and Medicare run out of money and are forced to draw cash from general revenues. Democrats are running around the country claiming that “all is well” with entitlements and the GOP only wants to cut them so more people will die. Their irresponsible behavior will only make it that much harder to rein in entitlements when they are already bankrupting the country. Anything that can’t go on forever, won’t. RICH LOWRY: TRUMP IS WINNING THE IMMIGRATION DEBATE. He isn’t doing it through sustained, careful attention. He tweeted the other day that the media will eventually have to cover his success at the border, even though he himself has devoted more energy to his war with CNN than promoting the reduction in illegal border crossings. No, it is the sheer fact of his November victory, and the data showing the importance of the issue of immigration to it, that has begun to shift the intellectual climate. It had been assumed, even by many Republicans like Sen. John McCain, that opposition to amnesty and higher levels of legal immigration would doom the GOP to minority status forevermore. Trump blew up this conventional wisdom. 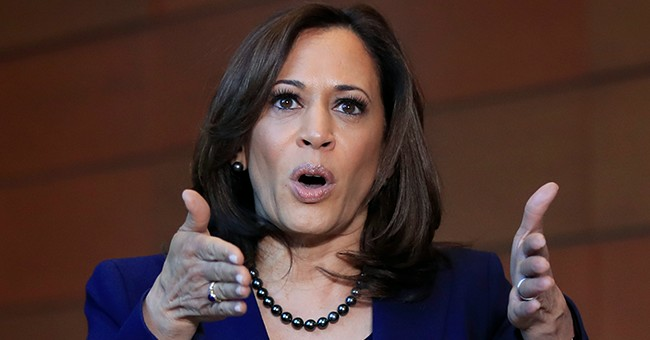 Now, intellectuals on the center-left are calling for Democrats to rethink the party’s orthodoxy on immigration, which has become more and more hostile to enforcement and to any skepticism about current high levels of immigration. The swing here was enormous. A Trump defeat in November after running on an exaggerated version of immigration restriction would have sent Republicans scurrying back to the comfortable, corporate-friendly cliches about so-called comprehensive immigration reform. And if Hillary Clinton had won on a platform that doubled down on Obama’s executive amnesties, serious immigration enforcement would have lost its political legitimacy. Trump probably wouldn’t have won without running so directly into the teeth of the elite consensus. Well, if Trump can get the Dems to double down on open borders, while also calling Western Civilization fascism and praising Jihad, he could take 45 states in 2020. POP: The debt-bubble landmine Obama left for Trump. That’s a 50% increase in an economy which has barely grown since 2009. And as Glenn likes to remind you, anything that can’t go on forever will stop. DAMON LINKER: The global elite are headed for a fall. And they don’t even know it. They are themselves the greatest beneficiaries of the global meritocracy — and that very fact serves to validate its worth. They live in or near urban centers that are booming with jobs in tech, finance, media, and other fields that draw on the expertise they acquired in their educations at the greatest universities in the world. They work hard and are rewarded with high salaries, frequent travel, nice cars, and cutting-edge gadgets. It’s fun, anxious, thrilling — an intoxicating mix of brutal asceticism and ecstatic hedonism. The problem is that growing numbers of people — here in America, in the U.K., in France, and beyond — don’t see it like this at all. Or rather, they only see it from the outside, a position from which it looks very different. What they see is a system that is fundamentally unjust, rigged, and shot through with corruption and self-dealing. They see Marissa Meyer, the CEO of Yahoo, taking home a cool $186 million in stock (on top of many millions in additional salary and bonuses) for five years of “largely unsuccessful” work. . . .
Something that can’t go on forever, won’t. North Korea launched a ballistic missile Wednesday into the East Sea, South Korea’s military said, just two days ahead of summit talks between US President Donald Trump and his Chinese counterpart Xi Jinping. The projectile is estimated to be “a type of KN-15 medium-range ballistic missile,” also known as Pukguksong-2, and the maximum altitude of its flight was 189 km, a senior JCS official later told reporters. He said the North seems to have aimed to test the technology of its ballistic missile technology and also considered the timing just before the U.S.-China summit. Citing an initial assessment, the US Pacific Command also said the projectile seems to be a KN-15 ballistic missile fired from a land-based facility. It flew nine minutes, added the Hawaii-based command. In an interview with the Financial Times, Trump warned that the US will take unilateral action to get rid of the North’s military threats unless China does its part. Yes. Here’s some deep context which will help readers understand current events on the Korean peninsula. MATTHEW CONTINETTI: Who Rules the United States? Read the whole thing, but the answer to the headline question is in the question itself. The people of the United States are to be governed, not ruled — and lightly governed, at that. But the Permanent Bureaucratic Class feels doesn’t see it that way. SOMETHING THAT CAN’T GO ON FOREVER, WON’T: California’s Pension Woes Set To Deepen In 2017. In 2015, California tried to reform CalPERS to address its shortfalls, but they didn’t do nearly enough. The system currently assumes annual returns of 7.5 percent, which is still far too optimistic. So CalPERS plans to revise its expectations downward, which would force governments to kick in more money to meet liabilities. Local government budgets, of course, are already stretched. It isn’t long before they’ll have to ask the state and, potentially, the federal government for a bailout. And with Republicans in control in Washington, it’s hard to imagine California getting any sympathy. California’s state government has enjoyed finally being back in the black. But with all these pension liabilities coming due, it’s unclear how long the good times will last. If you’re underfunding pension liabilities, you’re not really in the black. Pension hawks celebrated in August when a California appeals court upheld a state law limiting the ability of public employees to spike their pensions late in their careers. But with the case possibly headed to the state’s Supreme Court, the battle isn’t over yet. . . .
It’s no surprise that the unions are looking to get the ruling tossed. Hopefully the California Supreme Court won’t give more cover for more can-kicking and phony accounting. Municipalities in the Golden State and across the country are facing deep fiscal holes that they will not emerge from without either adjustments to pension guarantees or draconian cuts to vital public services like education or public safety. As more and more cities start to feel the tremors of the coming avalanche of defaults and credit downgrades, judges need to give local governments more fiscal flexibility than they have had in the past. Without that flexibility, more municipalities are headed for bankruptcy. And once they file for Chapter 9, all bets are off, and pensioners could face an even worse haircut than anything being discussed today. Something that can’t go on forever, won’t. Debts that can’t be repaid, won’t be. Promises that can’t be kept, won’t be. Plan accordingly. OREGON’S LOOMING PUBLIC PENSION CALAMITY: Oregon officials face truth behind state’s soaring public pension costs: ‘It’s a little bit like a Ponzi scheme,’ the chair of the Oregon Investment Council says. Last week’s meeting was extraordinarily candid. And it provided a brief, reality-based peek behind the financial charade taking place not only in Oregon’s pension system, but also in systems across the country. Experts openly acknowledged they’re understating the magnitude of Oregon’s problem. They’re relying on optimistic assumptions about investment returns. And they’re holding down required pension payments below what’s needed to keep pace with the debt, to avoid eviscerating school and government budgets across Oregon. Politicians just keep kicking the can down the road, hoping the bill will fall due after their time. That’s worked so far, but something that can’t go on forever, won’t. I feel pretty confident that any proposed fix will involve taking money from me and giving it to Democratic constituencies. HOUSE OF CARDS: Companies Build Bonds for European Central Bank to Buy. THAT MEANS IT’S WORKING: ObamaCare problems deepen as insurers scramble to stem losses. One by one, the nation’s top insurers – Humana, UnitedHealth Group, Blue Cross and Anthem – have shifted their tone on the law. Once optimistic, each has reported struggles with plans sold on the exchanges. Many say they weren’t ready for the influx of customers that have generated more claims than predicted. As a result, companies are scrambling to find ways to cut their losses and stop the fiscal bleeding. A few say they’ll be forced to pass on costs to customers. Already, rates on the exchanges are skyrocketing. From 2013 to 2016, almost every state has seen an increase in monthly premiums. In Michigan they are expected to jump 17.3 percent this year. In Virginia, the average premium increase could hit 37.1 percent, Bryan Rotella, attorney and founder of the Rotella Legal Group, warns. Blue Cross reported losing hundreds of millions of dollars on its exchange plans across the country. In Tennessee, it took a $300 million hit; in North Carolina, $280 million and in Arizona, $135 million. In California, the company is expected to raise rates 19.9 percent – more than triple the average annual increase. Others like Humana are threatening to quit altogether. SOMETHING THAT CAN’T GO ON FOREVER, WON’T: California’s Six Figure Pension Club Has More Than 20,000 Members. Curious that the left is obsessed with the word “sustainable,” when so many of their fiscal policies aren’t. SOMETHING THAT CAN’T GO ON FOREVER WON’T: The California Pension Bomb Just Got More Explosive. SOMETHING THAT CAN’T GO ON FOREVER WON’T: Could the Tide Be Turning Against Campus Illiberalism? SOMETHING THAT CAN’T GO ON FOREVER, WON’T — BUT KNOWING THERE’S A BUBBLE ISN’T THE SAME AS KNOWING WHEN IT WILL POP: How Long Will the Classic Sports-Car Bubble Last? I’VE BEEN WARNING ABOUT THIS FOR YEARS HERE AT INSTAPUNDIT: The Pension Crisis Keeps Getting Worse. The $2 trillion public sector pension shortfall created by decades of interest group bullying and political fecklessness is not going away on its own. In fact, according to a recent report from a major consulting firm, it’s getting steadily worse. . . .
It’s important to note that the major market indices actually rose substantially over the time period covered by the report. If Wilshire assessed the solvency of public pension funds today, after months of market turmoil, the situation would likely be even more grim. At least some state and local governments are taking steps to reform their public pension systems before it’s too late. For others, that moment may have already passed. It’s probably only a matter of time before the most indebted states and localities start going hat-in-hand to the federal government requesting massive bailouts. Time for think tanks, academics, and policymakers to start preparing for this eventuality: Should Congress be prepared to offer any assistance, and if so, on what terms? The problem: Congress is broke too, but still in denial. WALTER RUSSELL MEAD: The China Bubble: It’s probably bursting, one way or another. And the world hasn’t figured out what to do about it. China’s slowdown is having knock-on effects around the world. Here at TAI, we have been following the commodity crash story for some time—and not just as a piece of economic news mostly interesting to financial market speculators. This is a political and a geopolitical story as well. Falling commodity prices matter to everything from the security of Putin’s power base to the ability of the oil-dependent Nigerian state to wage an effective war against Boko Haram; the fate of democracy in countries like Brazil and South Africa is complicated by the prospective fallout from the commodity crash; Venezuela may implode into chaos as a result of the oil crash, and fears for Venezuela’s future were a major consideration in Cuba’s decision to respond to the Obama Administration’s normalization overtures. In other words, significant shifts in world commodity prices can tilt the balance of power, undermine the stability of some governments, and boost the prospects of others. But the story may be getting still bigger. We may be looking at something more serious than the unwinding of a commodity boom; we may be looking at the bursting of a bubble that could dwarf what happened in 2008. The China Bubble is bigger than the real estate bubble, and its liquidation could pose bigger risks for world politics than the subprime implosion. There’s a difference between China and the China Bubble. China is a middle-income developing country bumping up against the limits of a growth model built on massive exports of manufactured goods. There are lots of bubbles inside China, largely because both national and local governments have pursued a mix of stimulative policies even as the health of the underlying growth model deteriorated. Massive over-investment in real estate, infrastructure and manufacturing capacity, overvalued stock prices and poorly priced financial assets have created an increasingly toxic and dangerous economic situation inside China, and a rattled government is doing its best to keep the system from imploding. The government is hoping to achieve a ‘soft landing’ as China switches away from growth led by manufacturing for export to growth led by services and internal consumption. We shall see; China’s regulators and managers are skilled and have a lot of ammunition. But this is a difficult maneuver to execute and as Chinese society and the Chinese economy both become more complex, the task of running the country keeps getting harder. The China Bubble on the other hand is an international phenomenon. All over the world, the producers of commodities and manufactured goods have bought into the idea that Chinese demand is a perpetual growth machine. That’s a little taste of what will happen in the general election, but we conservatives have to face the heat and tell the truth. Imagine Supreme Court litigator Ted Cruz (or whoever) on the stage at a debate with Hillary, when everybody’s watching and she’s minimally able to rely on the media to save her. Hillary starts talking about what a friend to women she is, and Cruz comes back with her shameful treatment of the women her husband abused. Yeah, I expect the moderators to pull a Candy Crowley and screech and intervene to stop it, and the next day the mainstream media will be full of pearl-clutching outrage about the Republican daring to bring up a subject that they’ve decreed was off-limits. But normal people will ask. “Hey, wait a minute. Hillary did what? Why are we only hearing about this now?” And the fact that we have an alternative media – talk radio, Twitter, Facebook, the net in general, means that we can get our ideas and our views out there. They can’t gatekeep her track record of perfidy forever. Thank you Don Lemon, not only for bringing me an ungodly amount of attention and making me a conservative martyr, but for revealing the mainstream media’s tactics, techniques and procedures to silence conservatives and keep them from telling the truth about your gal Hillary. We have the truth, Republicans – let’s not be afraid to tell it. TRUE: We Shouldn’t Ignore Female Domestic Abusers. When men abuse women, they are rightfully chastised, punished and maligned. But when women abuse men, they are often ignored or receive only a slap on the wrist. Beiwel, who identifies as a feminist (the “equal opportunity” kind of feminist, she says, not the “burn the patriarchy” kind of feminist), brings up two examples of celebrities who abused their partners. Chris Brown, who assaulted fellow singer and then-girlfriend Rihanna; and Emma Roberts, an actress who was arrested in 2013 for attacking her then-boyfriend and co-star Evan Peters. Brown will forever be remembered as the man who assaulted Rihanna, his career took a hit (though he seems to be doing fine now) and he was angrily discussed at length around the world. Roberts, conversely, received no such condemnation. . . .
Beiwell also decries the use of female domestic violence against men as a form of comedy, noting that if men were beating up women in sitcoms no one would be laughing. She also points out that the old “victim-blaming” approach to questioning abuse victims still applies to men — they are told it was their own fault or even arrested in place of the actual abuser. Men also have fewer resources as abuse victims. It’s almost as if there’s some sort of war on men going on or something. It was kept from public view for months and months, kept hidden until Mayor Rahm Emanuel won re-election with black voter support. But it couldn’t be suppressed forever. Since the video was released, protesters have taken to the streets, demanding “Rahm Resign” and the mayor became publicly weepy, telling us once again that he wanted to be a Rahm reborn, a better version of himself. Who knows? Maybe he was hoping to put on that warm and fuzzy campaign sweater — the one he wore when he cut those re-election commercials to announce he’d be a kinder, more reasonable, and less imperious Rahm. But you can’t play the sweater game twice. And the city can’t forget what he’s done. So a month later, where is Chicago? The mayor limps along, weakened, his public approval ratings underwater. New polls say what I’ve told you for weeks: That if the Laquan McDonald video had been made public before Election Day, Rahm would not be mayor today. That makes people feel as if he’s cheated them. So resentment builds against the mayor most of Chicago never really liked, but feared. And now that he’s been humbled, he’s ripe. FUNDAMENTALLY TRANSFORMED: The Hill: Ex-GAO head: US debt is three times more than you think. Something that can’t go on forever, won’t. Promises that can’t be kept, won’t be. Debt that can’t be repaid, won’t be. Plan accordingly. Well, you know what they say: Something that can’t go on forever, won’t. EUROPE’S IMMIGRATION PROBLEM is structural. This time the crisis is over one of Europe’s most cherished icons: the Schengen visa-free/passport-free zone, which has given the European project arguably its strongest evidence yet that a larger and ultimately “pan-European” community would emerge from the nation-states bound by the treaty and the ideals behind it. The current wave is fast invalidating all earlier numerical projections: Germany is looking at about 800,000 asylum applications this year; in July alone more than 100,000 people entered Europe, mainly through Greece and Italy. Reportedly, EU Commission President Jean-Claude Juncker will now call for the member countries to resettle the 160,000 people who have reached Greece, Italy, and Hungary—a fourfold increase relative to two months ago. This is the “Schengen wave” of immigration; now reaching the point of entry places one within striking distance of Europe’s interior. So it now will come to this: Germany’s Angela Merkel will insist that increasing resettlement quotas for all is inevitable, making it a litmus test of intra-EU solidarity. If she gets her way—and she likely will next week—Greece, Italy, and Hungary will be allowed to dispatch the migrants from their territory to other countries, establishing an ad hoc quota policy of sorts. Problem solved? Not so fast, as another deal on the resettlement quota will not alter the overall migration dynamic or momentum, with push and pull factors (war in MENA and Europe’s generous social support and prospect of a better life) now mutually reinforcing and locked in. And in a world framed by instant communications and social media, the message of Europe’s promise will continue to go out to the desperate and the entrepreneurial thousands, reinforcing their determination to come. You can’t have open borders and generous welfare benefits. At least, not for long. And something that can’t go on forever, won’t. REALITY ASSERTS ITSELF: UK FOLLOWING SCOTT WALKER’S EXAMPLE. The UK is not exactly a bastion of right-wingery. As a hoary political joke has it: In the UK, they have two parties—the Labour Party, which we in the U.S. would call the Socialist Party, and the Conservative Party, which we in the U.S. would also call the Socialist Party. And in the American context, Wisconsin is not a particularly right-wing state. Why are unions not getting their way in these places? The answer is not, pace the wailings of Richard Trumka, a labor leader and Scott Walker critic, that Gov. Walker is some unique right-wing monster—and the same holds true for British PM David Cameron. As Richard Aldous pointed out in a must-read essay yesterday, the British voters reelected Cameron because of, not despite, his austerity and reform agenda; likewise, Wisconsin voters chose three times to keep Scott Walker in office. The waning of the blue model isn’t just an American phenomenon. The inability of Western countries to support and pay for lavish public sector pensions and benefits is becoming more apparent. Voters are giving politicians on both sides of the pond a mandate to do some remodeling. CHANGE: Rand Paul readying Hill push for guns on military bases and in recruiting stations. Well, we can’t rely on civilian volunteers protecting them forever. CORRUPT, FECKLESS LEADERSHIP PRODUCES PREDICTABLE RESULTS: Think Greece can’t happen here? You’re wrong. ALAN GREENSPAN: U.S. ‘Way Underestimating’ the National Debt. Something that can’t go on forever, won’t. Promises that can’t be kept will be broken. Debt that can’t be repaid, won’t be. Plan accordingly. Cost of attending Georgetown: $67,520 per year. Something that can’t go on forever, won’t. No one knows exactly what factors are causing prices to fall so far, so fast, but there is a strong suspicion that Saudi Arabia, which you can think of as the central banker of OPEC, is letting prices fall in the hopes of killing off the competition from U.S. and Canadian shale oil. The question, then, is: Who will blink first? At first blush, you might think that Middle Eastern oil producers have the upper hand. Their oil requires relatively little investment to get out of the ground; it’s not quite as simple as sticking a straw in the desert and sucking out the black stuff, but it sure looks like that compared to the complexity of a fracking operation. And fracking wells dry up fairly quickly, requiring even more investment just to stay in place. But the shale oil producers also have some advantages. First of all, the Saudis need high prices to support their government spending — the IMF estimates that they require a price of about $90 a barrel just to pay the bills. That means they can’t keep up a price war forever. Second of all, upstart industries tend to improve pretty quickly in their first years or decades of operation, and fracking is no exception; my Bloomberg News colleagues report that the break-even point for many operations is $70 or less, which is lower than OPEC nations can sustain. Even if they manage to push U.S. and Canadian fracking operations offline temporarily, the technology and expertise still exist. It took less than 10 years from the time when prices started soaring to the point where the U.S. was producing more oil than most OPEC members. If oil prices soared again, it would take even less time to get up and running again. ELECTING DE BLASIO WAS CERTAINLY A MOVE IN THAT DIRECTION: Is New York the Next Detroit? Like many state and local pension funds, the city has tried to make up the difference between its projections and what the market actually delivered by plunging into higher-risk investments. Those more complicated investments came with higher fees . . . and the possibility of big losses. The city seems to have taken at least one major bath, on a private equity fund that closed in 2011. A lot of people would like the city to return to more conservative investments managed by in-house managers; former Mayor Michael R. Bloomberg . . . oversaw an effort to move in that direction a few years back. But one major thing is standing in the way: politics. It’s not just the fiscal hit that the city would take from adopting a less risky, more realistic approach; it’s also opposition from unions. . . . In New York, reports the Times, the unions don’t want to move to more conservative pension accounting, because if they do, the city will be required to put more money into the pot . . . and the taxpaying public might mobilize against the union workers who put them in this spot. Of course, putting it off will ultimately just make the problem worse; the inexorable logic of compounding is just not very forgiving. USA TODAY: Deficits drop but debt bomb ticks on. The Tea Party is the reason deficits dropped after 2010. But we’re still adding debt — and even during the “surpluses” of the Clinton era, the debt continued to climb. Something that can’t go on forever, won’t. GALLUP ON STATE GOVERNMENT: Corruption a Factor in Illinois Residents’ Lack of Trust. Well, it’s a state noted for producing corrupt politicians. You can’t expect voters to ignore that forever. DER SPIEGEL: Green Fade-Out: Europe to Ditch Climate Protection Goals. At the heart of the matter is the simple fact that renewable energy comes at a premium, and the costs for propping it up have been passed along to consumers, both industrial and residential, in the form of higher electricity costs. Yet this turn towards green energy has produced a browner energy landscape. Germany produced more energy from coal in 2013 than it had in nearly a quarter century, and its emissions actually rose. . . .
German businesses are considering jumping ship for cheaper energy prices in the developing world or (gasp!) the United States. For households, these subsidies have acted like a particularly regressive tax: The poor feel the bite of higher electricity bills than do the rich. Germany’s new energy and economy minister Sigmar Gabriel is expected to announce a plan to cut renewable energy subsidies later this week in an effort to keep electricity prices down. That will be a step in the right direction, but significant damage has already been done. LATE-STAGE SOCIALISM: Venezuela’s House Of Cards. “Just how big of a problem is inflation in Venezuela? The implied annual inflation rate in Venezuela is actually now in the triple digits, coming in at a whopping 283%, as shown in the chart below. What’s more, the implied monthly inflation rate has now ramped up to 36%, as shown in the chart below. That’s dangerously close to the hyperinflation threshold of 50% per month. This is due to an accelerating depreciation of the bolivar, reflecting Venezuelan’s deteriorating economic outlook.” The same actions produce the same results. And something that can’t go on forever, won’t. SOMETHING THAT CAN’T GO ON FOREVER, WON’T: Everyone Wants To Go To Export Heaven. What’s interesting is that we’re having exactly the same ritualistic spats that we were having 10 years ago, when I first started writing for the Economist. Japan, China and Germany are entirely dependent on exports to keep unemployment to a low roar. The U.S. is running a persistent current account deficit and, in fact, hasn’t been in the black since 1990. No one thinks this is sustainable. But none of the big players wants to end it, either; Americans aren’t ready to actually start saving like a grown-up nation, and the export powerhouses are desperately trying to accumulate a massive hoard of IOUs before their entire populations age into Centrum Silver territory. Yet unlike Germany, Japan and China, the U.S. feels the need to actively argue in favor of its own position. China doesn’t go around trying to get other nations to export a quarter of their gross domestic product. In fact, China would rather not have the competition. But the U.S. has to complain. And I have to wonder if we don’t feel a bit guilty about our running tab with, well, the rest of the world. We’re like a drunk who wants to reform but knows he lacks the willpower, so he urges the bartenders to close down and take up haberdashery. Which is a good guide to how effective the whole thing is. Promises that can’t be kept, won’t be. Debts that can’t be repaid, won’t be. Plan accordingly. A SOBERING GRAPHIC: The Reality Of America’s Finances. Once again: Something that can’t go on forever, won’t. Promises that can’t be kept, won’t be. Debt that can’t be repaid, won’t be. Make your plans accordingly. HOPEY-CHANGEY: U.S. Adds Two Times More Debt than Economic Output in Last 2 Years. Something that can’t go on forever, won’t. IT’S NOT REALLY A “CEILING” IF YOU KEEP RAISING IT: Washington Post: A recent history of America’s debt ceiling, in one interactive graphic. “If lawmakers and the White House can reach an agreement to raise the debt ceiling this fall, it will be the 40th time the limit was raised since 1980.” Something that can’t go on forever, won’t. Make your plans accordingly. MORE ON THOSE UNDERFUNDED / OVERGENEROUS PUBLIC PENSIONS. MOSTLY OVERGENEROUS, IT SEEMS. California public pension payouts doubled after bump in benefits. The average retirement payout for new retirees in California’s biggest public pension system doubled between 1999 and 2012, according to CalPERS data, and initial monthly payments for one group nearly tripled in that period. State and local cops and firefighters benefited the most. In the 14 years covered by the data analyzed by The Sacramento Bee, average first-month pensions to state police and firefighters went from $1,770 to $4,978. California Highway Patrol officers’ first-month retirement payments doubled from $3,633 to $7,418, and local government safety employees’ pensions went from $3,296 to $6,867. Something that can’t go on forever, won’t. Debts that can’t be repaid, won’t be. Promises that can’t be kept, won’t be. PUBLIC PENSION CRISIS UPDATE: San Bernardino 1, Calpers 0. San Bernardino just received the judicial go-ahead to declare bankruptcy more than a year after its initial bankruptcy filing. The ruling, delivered by a federal bankruptcy court on Wednesday, concludes a long legal battle between the city and Calpers, which was fighting to keep the city out of bankruptcy in order to keep its funds flowing into the pension coffers. It now looks like Calpers will have to get in line with the city’s other creditors, meaning it will probably have to take a haircut just like everyone else. . . . The bankruptcy of one of California’s biggest cities is a major story in its own right, but even more important is what this tells us about Detroit, the country’s largest municipal bankruptcy case. Followers of that saga will note that Detroit’s pension funds are using tactics very similar to those of Calpers, fighting in court to keep the city out of bankruptcy. The Times is careful to note that the two cases are different, and that San Bernardino’s case is not precedent-setting for Detroit. But this is nonetheless an early indicator for how federal bankruptcy courts might treat these cases moving forward—and it gives Detroit’s public pension funds plenty more to worry about. Something that can’t go on forever, won’t. Promises that can’t be kept, won’t be. Debt that can’t be repaid, won’t be. PUBLIC PENSION UPDATE: Salon Warns Public Workers: Your Pensions Are Not Safe. Something that can’t go on forever, won’t. Debts that can’t be repaid, won’t be. Promises that can’t be kept, won’t be. Plan accordingly. I think that’s probably right. My colleague Ben Barton has just finished a book for Oxford University Press on what’s happening to the legal profession, and he makes a similar point quite persuasively with reams of data. Something that can’t go on forever, won’t. That’s the defining sentence for this decade, I believe. 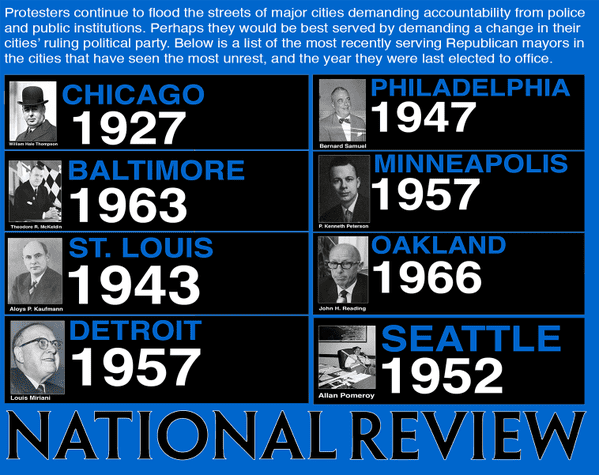 Detroit’s situation seems almost unprecedented, and it’s not clear how the city can best respond to it. The unions’ biggest problem is that Detroit simply cannot pay their pension claims without destroying city services. Detroit doesn’t have the money to provide even minimal services to its current population while paying off the large numbers of retired workers, many of whom hail from times when the city was larger and richer. Because there is no money, there is no solution that gives the unions the relief they seek. Total obedience to the state constitutional mandate might not be possible, and that’s a problem. The government can pass a law saying that everyone has a constitutional right to a free trip to the moon, but if it doesn’t build the spacecraft that can get you there the right is void. While the principle that federal law trumps state law on most issues is pretty clear, there are real arguments on both sides in this complicated case. But if the state constitution is unenforceable as well as being in conflict with federal law, it would be that much harder for the state constitution to block the execution of federal bankruptcy law. However the courts eventually decide, decades of misgovernance, the criminal corruption of the Democratic Party in Detroit, and the depraved indifference of politicians at every level as crooks and hacks conspired together to loot and wreck a great American city have brought us to a place where Detroit’s problems seem almost beyond solution. The saddest part of this story is that there is still much, much more pain to come for a lot of people. Both the residents of current day Detroit and the cops, teachers, firefighters and others who trusted in the promises of Detroit politicians and union officials face a world of hurt. The 36-year-old single mother, given the pseudonym “Carina” in the news media, had more money to spend than many of the country’s full-time workers. All told, she was getting about $2,700 a month, and she had been on welfare since she was 16. In past years, Danes might have shrugged off the case, finding Carina more pitiable than anything else. But even before her story was in the headlines 16 months ago, they were deeply engaged in a debate about whether their beloved welfare state, perhaps Europe’s most generous, had become too rich, undermining the country’s work ethic. Carina helped tip the scales. . . .
“In the past, people never asked for help unless they needed it,” said Karen Haekkerup, the minister of social affairs and integration, who has been outspoken on the subject. “My grandmother was offered a pension and she was offended. She did not need it. In 2012, a little over 2.6 million people between the ages of 15 and 64 were working in Denmark, 47 percent of the total population and 73 percent of the 15- to 64-year-olds. . . . In addition, the work force has far more older people to support. About 18 percent of Denmark’s population is over 65, compared with 13 percent in the United States. Something that can’t go on forever, won’t, to coin a phrase. RELATED: German Bailout, Russian Haircut. ANN ALTHOUSE not impressed with Gail Collins’ attack on Ted Cruz. “This woman-defending-woman column ends with a recipe metaphor. Is that good gender politics? It resonates with what I think is Collins’s effort to make us see this interplay between 2 U.S. Senators in terms of a man patronizing a woman.” If you can’t respond to a guy who’s been in the Senate for ten weeks, when you’ve been in the Senate forever, without playing the “damsel in distress” card, then you shouldn’t be in the Senate. So I guess the takeaway from Collins’ piece is that DiFi should resign in favor of someone more . . . masculine. And they’re so anxious to destroy him because he’s Latino. HIGHER EDUCATION BUBBLE UPDATE: Total Student Loan Debt Has Nearly Tripled Since 2004. Total student debt stands at $966 billion as of the fourth quarter of 2012, the N.Y. Fed said in press materials, with a 70% increase in both the number of borrowers and the average balance per person. The overall number of borrowers past due on student loan payments has grown from under 10% in 2004 to 17% in 2012. Fewer people with student loans are buying homes, according to data in the report. Of borrowers ages 25 to 30 who are taking out new mortgages, the percentage of those with student debt has fallen by half, from nearly 9% in 2005 to just above 4% in 2012. “The higher burden of student loans and higher delinquencies may affect borrowers’ access to other types of credit and the performance of other debt,” the fed report concluded. Educational debt is now the largest consumer liability after mortgages. WALTER RUSSELL MEAD: WHAT COMES AFTER THE BLUE MODEL? As a result, the old way of doing things doesn’t work anymore. Some of the changes—like the multiplication of gadgets and rise of the internet—are widely considered to be wonderful things. Others, like the rise of instability in financial markets, the polarization of incomes and the consequences of the collapse in manufacturing employment for blue collar employment and wages, are much less popular. But the reality is that there is no going back to blue; Humpty Dumpty has fallen off the wall and he can’t be patched up. The question is what do we do now. Obama’s answer is more of the same, only bigger. I don’t think that will work. Something that can’t go on forever, won’t. WHY OBAMA WOULD RATHER TALK ABOUT GUN CONTROL: My USA Today Column: The debt is up about 60% since Obama took office. This can’t go on forever. SOMETHING THAT CAN’T GO ON FOREVER, WON’T: Michael Barone: History Suggests That Era Of Entitlements Is Nearly Over. They can’t, because those programs are unsustainable at any level of taxation. Something that can’t go on forever, won’t. That’s the problem with that whole war on the rich. Obama’s enemies are the small-business Kulaks, who vote Republican, but he can’t go after them without hurting the nobles who support Democrats financially. I’d push 5% per year cuts in federal spending across the board — no “flexible freeze” BS — and do it each year until the deficit was under control. I think this would sell fairly well politically, too. Nobody believes that any federal department couldn’t cut costs 5% without impacting performance. MORT ZUCKERMAN: Brace For An Avalanche Of Unfunded Debt: The fiscal cliff isn’t as scary as the looming deficit and debt crisis about to swamp the country. Something that can’t go on forever, won’t. Debts that can’t be repaid, won’t be. Promises that can’t be kept, won’t be. Make your plans accordingly. Something that can’t go on forever, won’t. Debt that can’t be repaid, won’t be. Promises that can’t be kept, won’t be. SACRE BLEU! The Collapse of French Pensions. France is between a rock and a hard place. French public debt is almost 90 percent of GDP, and the French people are unwilling to give up any more, even though France’s average retirement rate is lower than elsewhere in Europe. Sarkozy’s original reforms met with large protests, and any change in the retirement age by Hollande is likely to engender a similar reaction. As in America, years of disastrous blue policies and overgenerous pension promises are finally catching up with France. Now policymakers are left with with a depressing choice: renege on promises to workers or watch the system go broke. Hollande has made it clear that he doesn’t want to do anything that could be seen as an attack on the workers, but he may have no choice. When the money isn’t there, it isn’t there. Things that can’t go on forever, won’t. Debt that can’t be repaid, won’t be. Promises that can’t be kept, won’t be. Related: Task Force Warns of NY Budget Meltdown. SOMETHING THAT CAN’T GO ON FOREVER, WON’T. “My main consolation is that the change will uproot many of the delusions that have sprouted up. My main fear is that history shows this is never, ever, a peaceful process.” One way or another, the Gods Of The Copybook Headings will have their due. NITA GHEI: An End To European Bailouts. The desire to keep on spending in the face of economic crisis is universal. In Greece, parliament voted Wednesday to implement $17 billion in spending cuts, and the reaction was swift and violent. Public-service employees and others affected by the proposal erupted in riots on the streets of Athens. The move to trim the indebted nation’s outlays cleared the way for the European Commission, the European Central Bank (ECB) and the International Monetary Fund to send a check for $40 billion. This bailout cash will give Greece some breathing space and enable government employees to cash their paychecks. It also leaves unresolved the cause of Greece’s vast debt, currently estimated at 175 percent of gross domestic product. That’s particularly troubling because it appears there will be no country left in the European Union (EU) able to bail out Greece — or any other ailing nation — the next time bills come due. Sooner or later, you run out of other people’s money. Something that can’t go on forever, won’t. Debt that can’t be repaid, won’t be. Promises that can’t be kept, won’t be. NIALL FERGUSON: What Joe Biden Doesn’t Want You To Know. The reality is that the real distributional issue the country faces is not between percentiles but between generations. As Paul Ryan put it in a powerful peroration, which temporarily silenced the ranting to his right, “A debt crisis is coming. We can’t keep spending and borrowing like this. We can’t keep spending money we don’t have.” Already a staggering $16 trillion, the debt represents nothing less than a vast claim by the generation currently retired or about to retire on their children and grandchildren. . . . What we saw last week was not just a contrast between Irish-American political styles. We saw the opening round in the clash of generations that will soon dominate American politics. Something that can’t go on forever, won’t. Debt that can’t be repaid, won’t be. Promises that can’t be honored, won’t be. So I looked up the median price of a home in St. Paul. $197,607 (though this may change of course). It’s actually CHEAPER to BUY A HOUSE in St. Paul than educate one of their precious chllllllldrnnnnnnn. You could buy 1.1 houses per pupil instead of sending them to school. Or to put it another way, things that can’t go on forever, won’t. The fact that roughly half of Americans receive some government payment to which they feel morally entitled is a big part of our budget paralysis. It’s an inconvenient fact, but it’s still a fact. Dealing with it ought to define the next president’s mission. Somehow, he must question the status quo without insulting the roughly 150 million Americans who receive federal benefits. Who deserves support and why? How much and under what conditions? Unless we ask these questions and find grounds for trimming some benefits, the budget impasse will continue and risk dangerous outcomes: a future financial crisis; crushing tax increases; or draconian cuts in programs (defense, research, highways) that aren’t payments to individuals. This is arithmetic, as Bill Clinton might say. 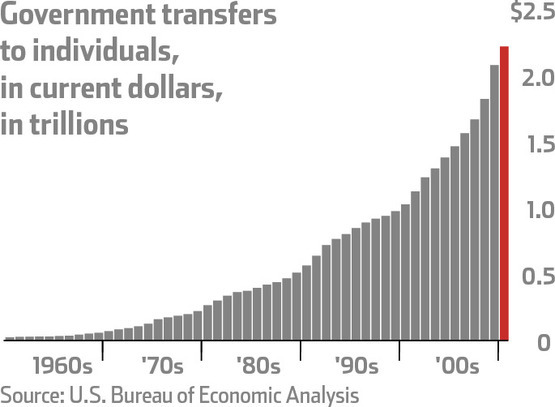 In 2011, payments to individuals were 65 percent of federal spending, up from 26 percent in 1960. America has created a welfare state, whether Americans admit it or not. Actually, the share of people who receive federal benefits exceeds Romney’s 47 percent. Based on its Survey of Income and Program Participation (SIPP), the Census Bureau estimates that in mid-2011 — the latest available figures — the number of people with benefits came to 149.8 million, or 49 percent of the population. But this figure is too low, because SIPP doesn’t include several major programs (farm subsidies and college loans and grants). With these, the total probably exceeds 50 percent. This will end when the federal government’s finances break down beyond the ability of the current Fed/Treasury jiggery-pokery to conceal it. Something that can’t go on forever, won’t. It’s important not only to try to bring things under control before a collapse, but also to explain what’s going on so that if the collapse happens anyway — say because Obama gets reelected — people understand what’s happening and why. Romney/Ryan can lay down markers there, too. Something that can’t go on forever, won’t. That observation, from economist Herb Stein, is likely to be the sum-up aphorism of this decade. A half-century of unfettered expansion of entitlement outlays has completely inverted the priorities, structure and functions of federal administration as these were understood by all previous generations. It is not only financial capital that is distorted by this, but moral and social capital as well. Key bit: “You just can’t rely on these optimistic assumptions that somehow the investment returns are going to be so great that you don’t have to worry about paying for this stuff.” Things that can’t go on forever, won’t. Debts that can’t be paid, won’t be. Also, The Problem In A Nutshell: Annualized GDP Growth Of 1%; Annualized US Debt Growth of 21%. Something that can’t go on forever, won’t. Debt that can’t be repaid, won’t be. MORE ON THOSE UNDERFUNDED / OVERGENEROUS PUBLIC PENSIONS: Moody’s Triples Pension Debt Estimates. As we follow the evolving story of collapsing public pensions, one of the trickiest issues is the lack of reliable estimates of future returns on investment. Many of the biggest offenders among pensions assume returns of 8 percent or higher. These numbers may seem reasonable by historical standards, but they’re hopelessly optimistic today. Even plans that have revised their estimates downward still project returns far above what most analysts expect. If these estimates don’t come through, taxpayers will be left holding the bag, and either pension payouts will have to shrink or other services, including education and law enforcement, will have to. Unions have long claimed that these worries are mere alarmism, but now Wall Street is stepping in to say it, too: pension investment projections are far too high. A new estimate from Moody’s anticipates average pension returns of 5.5 percent rather than the traditional 7 or 8 percent investment projection. The result of this estimate is a tripling of national pension debt, from $766 billion to $2.2 trillion. This is a major increase, but many analysts believe that it is accurate, or at least more accurate than previous estimates. Something that can’t go on forever, won’t. Debts and obligations that can’t be paid, won’t be. MEN: Defective, Or Just Unnecessary? “Earlier this year, women became the majority of the workforce for the first time in U.S. history. Most managers are now women too. And for every two men who get a college degree this year, three women will do the same. For years, women’s progress has been cast as a struggle for equality. But what if equality isn’t the end point? What if modern, postindustrial society is simply better suited to women? A report on the unprecedented role reversal now under way— and its vast cultural consequences.” Something that can’t go on forever, won’t. WALTER RUSSELL MEAD: Public Pension Cutbacks Spread Across The Country. Something that can’t go on forever, won’t. EUROPE: Employees at Just One Paris Hospital Are Owed 2 Million Vacation Days. Something that can’t go on forever, won’t. Related: Britain: The busiest online shopping day of last year was the day of a mass public sector strikes. INDEED: The Spenders Won 2011: Republicans fell for Obama’s backroom budget trap. But something that can’t go on forever, won’t. GOOD QUESTION: The Law School Bubble: How Long Will It Last if Law Grads Can’t Pay Bills? “In 2010, 85 percent of law graduates from ABA-accredited schools boasted an average debt load of $98,500, according to data collected from law schools by U.S. News & World Report. At 29 schools, that amount exceeded $120,000. In contrast, only 68 percent of those grads reported employment in positions that require a JD nine months after commencement. Less than 51 percent found employment in private law firms.” Something that can’t go on forever, won’t. Actually, we do. If “youths” felt they were at serious risk of being shot when attacking innocents, this sort of thing wouldn’t happen. And, in fact, not so long ago they were, and it didn’t. If these problems become widespread, the antidote will present itself. “Youths,” in general, do what they can get away with, and don’t do what they can’t. MORE ON THOSE UNDERFUNDED / OVERGENEROUS PUBLIC PENSIONS: Public retirement ages come under greater scrutiny. After nearly 40 years in public education, Patrick Godwin spends his retirement days running a horse farm east of Sacramento, Calif., with his daughter. Such guaranteed pensions for relatively youthful government retirees — paid in similar fashion to millions nationwide — are contributing to nationwide friction with the public sector workers. They have access to attractive defined-benefit pensions and retiree health care coverage that most private sector workers no longer do. . . . With Americans increasingly likely to live well into their 80s, critics question whether paying lifetime pensions to retirees from age 55 or 60 is financially sustainable. An Associated Press survey earlier this year found the 50 states have a combined $690 billion in unfunded pension liabilities and $418 billion in retiree health care obligations. Yeah, as I’ve been saying for a while, if you graduate college with the equivalent of a mortgage already, you’re not going to be so quick to take on another one. Others, equally disturbing, at the link. Moral: Something that can’t go on forever, won’t. This can’t go on forever. RICHARD EPSTEIN: Why Progressive Policies Always Fail. We have rigged our tax policies so that, depending on the year, close to 40 percent of the income tax revenue comes from the 1 percent of the population that controls 20 percent of the wealth. Close to half the population pays no federal income tax at all. This is a political disaster in the making. The American economy is currently stagnating for two main reasons. At the top of the system, a relentless program of redistributive taxation undermines incentives for long-term investment and growth. Yet from this vain pursuit of economic equality, we get declining standards of living for all. Simultaneously on the ground, excessive regulation of labor and real estate markets chokes off growth — employer by employer and house by house. Our lopsided structure cannot last. Stock market losses cut the total income of so-called “one percenters” by around 30 percent between 2007 and 2009, with the greatest losses in the top 0.1 percent. Higher tax rates will drive that overall level of wealth lower still, given that so little government revenue comes from the bottom half of the income distribution. Low tax revenues plus shiny new entitlements create an unsustainable situation where 40 percent of current expenditures are funded by long term debt, on which principal and interest payments will soon come due. HIGHER EDUCATION BUBBLE UPDATE: Law School Stimulus: $54.3 Billion Student Loans Through 2020. The graphics on graduate debt levels are just plain scary. Just remember: Something that can’t go on forever, won’t. SOMETHING THAT CAN’T GO ON FOREVER, WON’T: CBO: U.S Deficit Ran $240 Billion For First Two Months Of Fiscal 2012. I repeat — if this were a Republican administration, the press would be full of sob-story reporting about senior citizens eating dog food because their CD rates are so low. HIGHER EDUCATION BUBBLE UPDATE: Student Loan Debt Hits Record Levels. “The amount of student loans taken out last year crossed the $100 billion mark for the first time and total loans outstanding will exceed $1 trillion for the first time this year. . . . Students are borrowing twice what they did a decade ago after adjusting for inflation, the College Board reports. Total outstanding debt has doubled in the past five years — a sharp contrast to consumers reducing what’s owed on home loans and credit cards.” Something that can’t go on forever, won’t. This can’t go on forever. USHA RODRIGUES: Scamlaw: Paternalism vs. Prudence. It is wrong for law schools to lie. About anything in general, and about placement statistics in particular. Wrong, wrong, wrong. I’m in favor of the Law School Transparency Project. Like I tell my students: lying is bad. Courts don’t like it, law schools shouldn’t do it, and you shouldn’t do it, either. OK, now that we’ve gotten that out of the way, the gravamen of the LawScam beef seems to be that students are incurring crippling debt and can’t get jobs that will make that debt manageable. I think that this is a bad situation. I feel bad about it. Even though, as I blogged 2 years ago, I think that state law schools in general–and Georgia Law in particular–come out looking pretty good. . . . Law schools are a form of social sorting. If you likewise agree, that means doing away with T3 and T4 schools means doing away with access to the legal profession for a whole swath of people. Maybe most of them shouldn’t be lawyers in the first place. That argument has lots of resonance now–and forever if you think, like Larry Ribstein, that the legal market is permanently changing. But if the market shifts again, and lawyers are back in demand, then without these T3 and T4 schools, there will be a lot of people with their noses pressed up against the glass, clamoring to be lawyers and mad that they can’t be. I’m inclined to agree with Ribstein, but this is a good point. Meanwhile, they’re having a whole symposium on the topic over at The Conglomerate, so just keep scrolling. 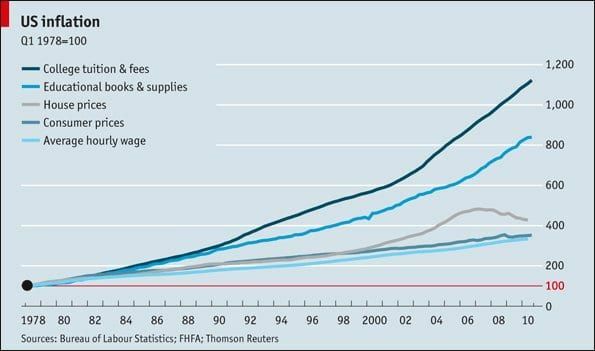 HIGHER EDUCATION BUBBLE UPDATE: In The Atlantic, The Debt Crisis At American Colleges. How do colleges manage it? Kenyon has erected a $70 million sports palace featuring a 20-lane olympic pool. Stanford’s professors now get paid sabbaticals every fourth year, handing them $115,000 for not teaching. Vanderbilt pays its president $2.4 million. Alumni gifts and endowment earnings help with the costs. But a major source is tuition payments, which at private schools are breaking the $40,000 barrier, more than many families earn. Sadly, there’s more to the story. Most students have to take out loans to remit what colleges demand. At colleges lacking rich endowments, budgeting is based on turning a generation of young people into debtors. As this semester begins, college loans are nearing the $1 trillion mark, more than what all households owe on their credit cards. Fully two-thirds of our undergraduates have gone into debt, many from middle class families, who in the past paid for much of college from savings. The College Board likes to say that the average debt is “only” $27,650. What the Board doesn’t say is that when personal circumstances go wrong, as can happen in a recession, interest, late payment penalties, and other charges can bring the tab up to $100,000. Those going on to graduate school, as upwards of half will, can end up facing twice that. A fact of academic life is that the tuition-debt nexus keeps most colleges going. Something that can’t go on forever, won’t. This can’t go on forever.